For the Reading part, you can highlight segments of text, you can also make text notes too, see image below. 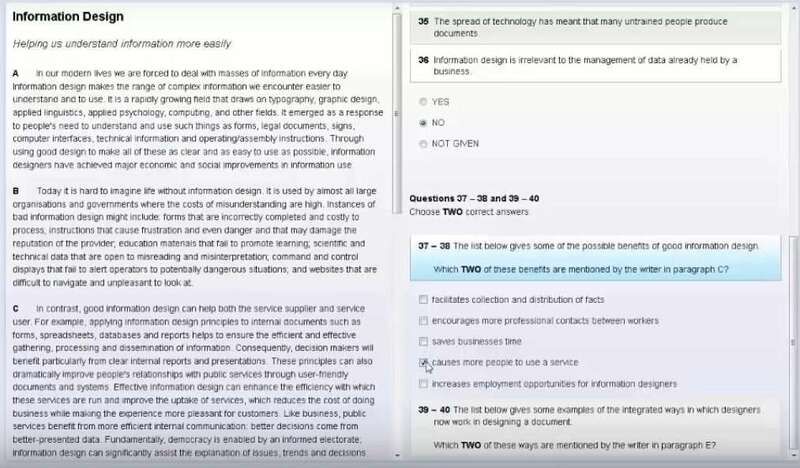 In the online course we ask students to only send in computer typed essays. Highlighting text takes much more effort and wastes time, following maps is more difficult, etc. Students with poor handwriting could lose points (more info here). Dmitry, a student from Russia, told me that he was at a 6.5 previously. He took the computer-based test and managed to get 7. He was convinced it was because it was computer-based. He said he suffered from writing slowly, and his handwriting was poor. I think this is quite common among students nowadays, especially those who don’t use the Latin alphabet daily (Chinese / Russians etc). Nowadays almost everyone is typing on computers, for work, school etc. Did you take the IELTS test on a computer? Leave a comment below (special surprise for students leaving a comment). It’s a mixture of normal buttons you would expect to choose your answer (multiple choice). It also includes drag and drop options for matching the headings. Yes, Ngwa. For most people, the traditional paper-based IELTS is better. Are you going to take the exam soon? Thanks for your feedback, Gurjeet! Have you passed the exam recently? Thanks for your comment, Raj! Are you going to take the exam soon? I have taken the paper IELTS Exam and the PC one, paper one I believe lasts longer. Although it was the first time being implemented in Mexico, an error occurred when I scrolled down in the listening, but it was my bad luck day the examiner just nodded and there was nothing I could do about it 🙁 not sure if it was because it was the first time it was being implemented. Sorry to hear about your IELTS experience on computer. Did you get the results you were aiming for? If you plan to take IELTS again, let us know and we’ll guide you. Very nice info, especially for first time takers to get an overview of how the Computer based test is going to look like and the TIPS are very useful too. Thx. This is a nice information. I’m taking ielts for the fourth attempt. Now, computer based test is a good alternative one to get the score I need. Good afternoon IELTS people. I have never taken IELTS on a computer but the first time I took the paper IELTS, I had the chance to use headphones and I felt comfortable because I am having hearing difficulties.